Home > Feel Good Stories > Pet News & Information > Wondercide > Wondercide CEO Stephanie is Pet Industry Woman of the Year Award Finalist! 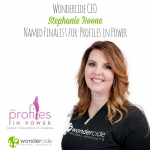 Wondercide CEO Stephanie Boone has been named a Pet Industry Woman of the Year Award finalist by Women in the Pet Industry Network for her service to pets and pet parents around the world. The team at Wondercide could not be prouder of the amazing impact Stephanie has had in reducing pets’ exposure to toxic chemicals and helping pet parents protect without poisons, using Wondercide’s full line of natural products. Stephanie will be attending the Women in the Pet Industry Conference and Awards Show in Portland this August, where the Pet Industry Woman of the Year will be announced. The conference and awards show will offer a wonderful chance to meet with some of the greatest leaders in the pet industry, who improve animals’ lives every day with their passion and innovation. Stay tuned for our followup post at the end of the summer to find out how it all goes! Thank you for providing my 10 rescues with Wondercide products that wash ’em, protect ’em from bad bugs and smell good. We love you and appreciate you. Hugs and kisses coming your way. Bird, Lulu, Chi Chi, MoMo, Buckaroo, BoBo, BellaBee, Benny, Suzie and Muffin. Thank YOU for supporting Wondercide, Frannie! I was going to try it today, but I can’t get my hands on any. Hard to find a place that has it, and then they are out of it. Thanks for your feedback and sorry to hear you were not able to find Wondercide in your area. We are adding new retail locations every day and working to make it convenient for everyone to buy it near where they live! In the meantime, you can buy Wondercide online at http://www.wondercide.com – if you have any other questions, feel free to email service@wondercide.com! I just saw you on the Shark Tank. I immediately went to Amazon and made the purchase. Hoping it will rid me of bed bugs. My granddaughter lives with me so a safe product was essential. I hope it does all you declared. Is it possible to export to my country & what is the procedure to adapt. I ordered my Wondercide Flea and Tick Spray with Kendra….who is wonderful to work with…..and upon receiving sprayed Brody and took him for a walk. Prior to finding your company and purchasing I did a lot of research and knew there had to be something out there that would do the trick without putting poisons into our best friends. I can’t begin to tell you how happy I am with your product and I’m sure Brody is relieved I’m not picking and probing like I was. I’ve been using for over a week now and have come across 2 dead ticks. That’s it!!!! And they were DEAD!!!!! He’s a Shih Tzu and I also had him buzzed to help with the application of Wondercide. If anyone says it doesn’t work they’re not applying it right. IT WORKS!! Soooooo very happy I found you and your company and I wish you all the success in the world for such a great product that works. Also, if you ever are in need of a rep on the East Coast….New Jersey…let me know. My background is in Marketing and I do a lot of Flea Markets and know lots of people that do Trade Shows. Would love to help you out any way I could!! Again the best to you all. Thanks so much for taking the time to share your experience with us, Karen! We’re thrilled to hear you and Brody are enjoying the spray just as much as we do 🙂 We’re so thankful for you!